Is anyone else having trouble grasping that it's already December? The new year will be here before we know it. At this crazy time of year, everyone can use a little help to stay balanced and healthy. So I'm sharing a few of my favorite holiday-related links for surviving and thriving in the next few weeks. Perhaps you read here on the blog that studies show eating on small plates can help you reduce portion sizes and calories. 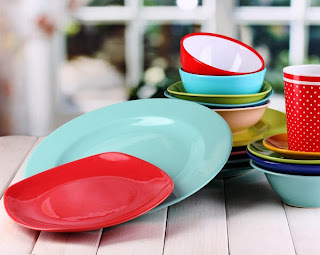 But do you know which color plates might help you eat less overall? Read this before selecting plates for your holiday buffet! 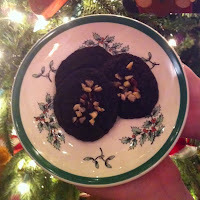 Today is National Cookie Day (December 4). While many bake all December long, you might be looking to indulge without taking a calorie hit. Why not give our 9 Calorie Skinny Chocolate Cookie recipe a try? Made with fiber-rich Skinny Noodles, these cookies are the perfect solution for those watching their weight and for those with diabetes or gluten sensitivity. Survival tip for a healthy holiday season: If you're hosting a party, have plenty of healthy food choices for everyone. And if you're going to a party, take along a healthy side dish. 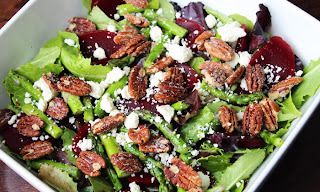 Skinny Mom blogger Brooke Griffin has lots of yummy healthy holiday side dish recipes on her site. Also, don't forget to check out the healthy recipes from Skinny Noodles. Remember use Skinny Noodles Spaghetti instead of regular pasta to cut 200 calories and more than 40 grams of carbs from a dish. With all of the extra temptations this month, are you finding time to get active? I sometimes have trouble getting motivated, especially with the cooler temperatures (brrrr!). I think the key to a calorie-torching workout is great tunes. When you're enjoying the music, it's easier to get started and keep going longer than usual. I love this holiday workout playlist from FitDay.com. With their upbeat tempo, these songs will keep you movin' and groovin' while you burn off holiday goodies. The playlist also comes in handy when you need extra mojo to wrap presents!